Ruins of old mills dot the landscape of the Valle dei Mulini (‘Valley of the Mills’). Their crumbled walls are the remains of abandoned structures which once filled the valley with human life. 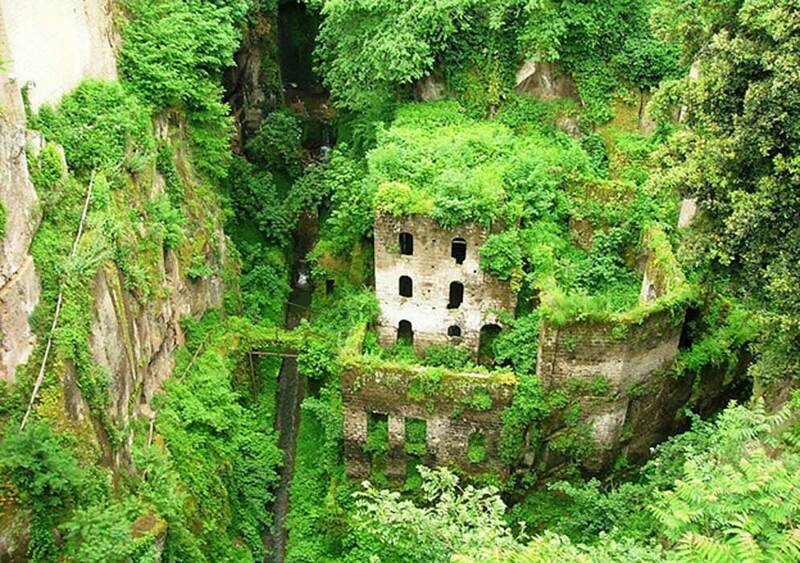 Now, the ruins have been reclaimed by Mother Nature. The outstanding foliage provides visitors with a soothing green view as they explore the ruins. The Valle dei Mulini is a site located in Sorrento, in the southern Italian region of Campania. As its name suggests, this valley is home to a number of flour mills. The ruins of these mills are today an unusual tourist attraction, especially for those who enjoy traveling off the beaten track. The Valle dei Mulini is believed to have been formed between 35000 and 37000 years ago. During this time, a massive volcanic eruption resulted in deep chasms being formed in the limestone plateau next to the present center of old town Sorrento. The debris from the eruption filled some of these fissures. Over time, water from an underground basin forced its way through the filled crevices, clearing the debris as it made its way to the Cape of Sorrento. As a consequence, new water sources were created, which encouraged humans to settle in the area. The earliest ruins in the Valle dei Mulini are believed to date to the 10th century AD and were constructed at the point where two streams, the Casarlano-Cesarano and the Saint Antonino, met. This location was necessary, as the buildings were mills, and relied on the flow of water from the rivers to function. 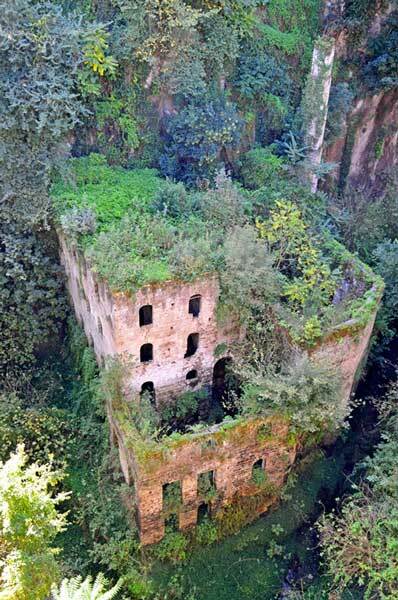 One of these was a flour mill, which ground wheat to produce flour for the people of Sorrento. Another of the ruins was a sawmill, which supplied the cabinet-makers of Sorrento with different types of high-quality wood, and something known as ‘wheat board’. This was a type of board made using chaff, which is the husk of wheat (or other grains) that is separated during winnowing or threshing. There is also a public washroom attached to the mills, which the women of Sorrento would use. The industrialization of the Valle dei Mulini continued over the centuries. At one point of time, there were as many as 25 mills operating in the area. 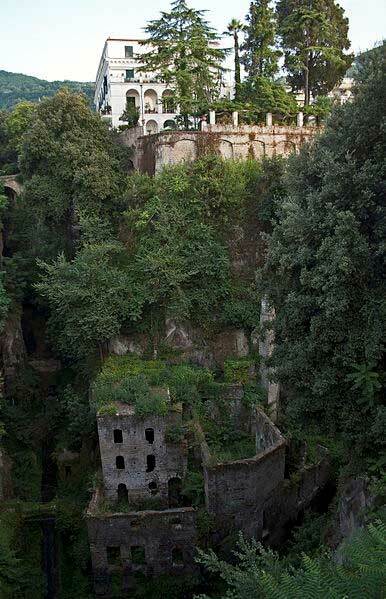 Many of the ruins you see today were once functioning paper mills, which turned the Valle dei Mulini into an important and successful paper-making center of the Republic of Amalfi, which existed between the 10th and 11th centuries AD. The mills in the Valle dei Mulini continued functioning for centuries, until they were abandoned around the 19th and 20th centuries. In 1866, the nearby Piazzo Tasso (‘Tasso Square’) was created, and the mills were relocated there. This move was necessary as the increasing humidity in the Valle dei Mulini was becoming unbearable for the workers who worked in the mills. Thus, the mills eventually became obsolete and fell into ruin as they were gradually abandoned in the decades that followed. With the departure of human beings, Mother Nature began to slowly reclaim the Valle dei Mulini. The increased humidity in the Valle dei Mulini produced a micro-climate which is conducive for the growth of certain plants. These plants would not be able to live in the drier surrounding area outside the valley. Ferns, for instance, began to take root in the stone walls of the mills, and eventually colonized the ruins, giving them a luscious coat of green. The floor and walls of the valley too became engulfed in vegetation over time, and the whole assemblage may be described as a green landscape that is soothing to the human eye. Today, visitors to Sorrento may view the Valle dei Mulini from above, and perhaps imagine that when human beings are gone, the world would look like that as well. In addition, the more adventurous may also take a trek to the valley, where they would be rewarded by spectacular views of the Amalfi Coast.